Following a terrible showing against the Patriots, the Jets superfan will be retiring from his role. Thanksgiving’s game between the Jets and Patriots was a tough pill to swallow for many a New York football fan. After New England racked up 21 points en route to a 35 second quarter it seemed as though unofficial team mascot, “Fireman” Ed Anzalone could not stomach it as he left the game before halftime. 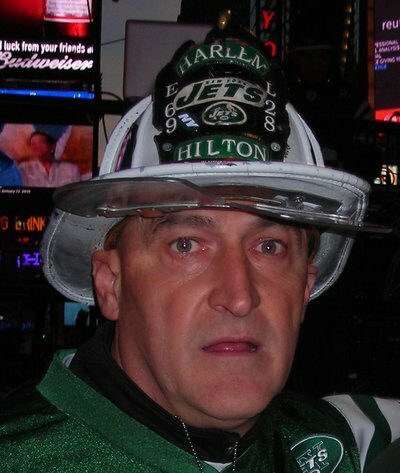 Anazlone, who is an actual NYC firefighter, has been leading Jets fans in cheering for their team at home games since 1986 and has become one of the most iconic figures of NFL fandom in doing so. Despite the timing of his departure, Ed insists that he has not quit on the Jets and that he will continue attending games as a fan. Instead, he left Thursday’s blowout in avoidance of a brewing altercation which he says has become an increasingly common problem. Ed’s decision to wear a Sanchez jersey in support of the team’s starting QB has made him the target of heckling and other confrontational behavior from other fans who believe backup Tim Tebow should replace Sanchez. Potential fights have developed “in the stands, the bathroom [and] the parking lot” so Anazlone is hanging up the green helmet to set an example for “the families and kids that enjoy the game and Fireman Ed.” Football may be a sport of controlled violence, but that does not justify the actions of those who have sought to rile Ed up. The Fireman says he “enjoyed meeting all the wonderful Jets fans around the world and look[s] forward to the day we all can raise the Lombardi Trophy.” His time in costume may have come to an end, but his love of the game and of the Jets clearly lives on. Are you said to see Fireman Ed go? Tell us about it on the Long Island Sports Forum. Subject: LongIsland.com - Your Name sent you Article details of "“Fireman” Ed Quits as Jets' Unofficial Mascot"